Saw this on Facebook this morning. Yeah. Funny stuff. 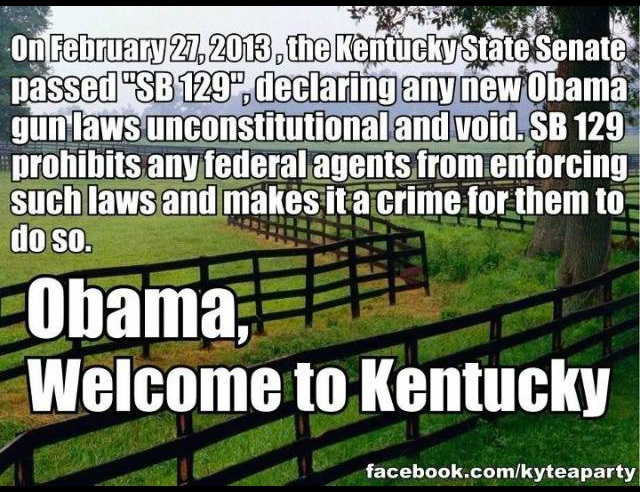 You’d think folks in Kentucky would remember the last time their elected leaders started picking and choosing which federal laws there were going to obey and which they weren’t. Lincoln didn’t start fighting the Civil War because he wanted to free the slaves. That’s what happened, eventually, but the reason the war started was because Lincoln knew that nullification was the acid that dissolved democracies. We are a nation of people bound together by laws and the customs by which those laws are made. This can only have meaning and function when we all agree that the laws and customs mean something. A state cannot decide what is or is not Constitutional. A state cannot make laws that nullify those lawfully made by Congress. To allow them to (or to even pretend like they can) is a sickening and dangerous slope that calls into question the very ideal our country is founded upon. I know. Big words. But it’s true. This is also the exact reason demands from the Tea Party Republicans in the House to defund or delay or in any way change one whisker of the Affordable Care Act must be totally rejected. They’re not, as was the case in the late 90’s, balking at a budgetary disagreement between the Congress and the president. Those disagreements were germane to that shutdown. What they’re trying to do is nullify the ACA by first shutting most of the government down and then by perhaps breaking the Full Faith and Credit of the United States. This is a billboard that recently went up near the Minnesota Fairgrounds (presumably to be seen by the 1.7 million or so people who will attend the fair later this month). Different insurance plans have different networks of doctors. That’s a long-standing fact. If your insurance plan changes, it’s possible your doctor doesn’t accept it (even if your insurance company stays the same). This is not a phenomenon created by The Affordable Care Act or Minnesota’s implementation of its state exchange (MNsure). If you already have insurance (which most people do), there’s nothing in The Affordable Care Act or MNsure that changes which doctor you can see. More FUD from the right meant to scare people into paralysis instead of actually addressing the issues we all have to face. Ironically, a single-payer system of health care would result in the widest choice of doctors since competing insurance plans with different networks of providers would presumable be eliminated. But let’s not talk about that.